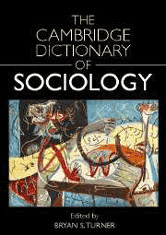 An indispensable guide to the vibrant and expanding field of sociology. Featuring entries, from concise definitions to discursive essays, written by leading international academics, the Dictionary offers a truly global perspective, examining both American and European traditions and approaches. Entries cover schools, theories, theorists and debates, with substantial articles on all key topics in the field.